For other uses, see Atrium (disambiguation). 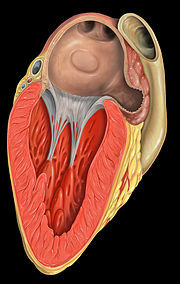 The atrium is the upper chamber through which blood enters the heart. There are two atria in the human heart – the left atrium connected to the lungs, and the right atrium connected to the venous circulation. The atria receive blood, and when the heart muscle contracts they pump blood to the ventricles. 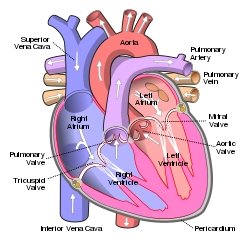 All animals with a closed circulatory system have at least one atrium (humans have two atria). The atrium used to be called the "auricle", and that term is still used to describe this chamber in, for example, the Mollusca, but in humans that name is now used for an appendage of the atrium. Humans have a four-chambered heart consisting of the right atrium, left atrium, right ventricle, and left ventricle. The atria are the two upper chambers. 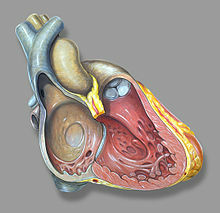 The right atrium receives and holds deoxygenated blood from the superior vena cava, inferior vena cava, anterior cardiac veins and smallest cardiac veins and the coronary sinus, which it then sends down to the right ventricle (through the tricuspid valve) which in turn sends it to the pulmonary artery for pulmonary circulation. The left atrium receives the oxygenated blood from the left and right pulmonary veins, which it pumps to the left ventricle (through the mitral valve) for pumping out through the aorta for systemic circulation. The right atrium and right ventricle are often referred to as the right heart and similarly the left atrium and left ventricle are often referred to as the left heart. The atria do not have valves at their inlets  and as a result, a venous pulsation is normal and can be detected in the jugular vein as the jugular venous pressure. Internally, there are the rough pectinate muscles and crista terminalis of His, which act as a boundary inside the atrium and the smooth walled part of the right atrium, the sinus venarum derived from the sinus venosus. The sinus venarum is the adult remnant of the sinus venous and it surrounds the openings of the venae cavae and the coronary sinus. Attached to the right atrium is the right atrial appendage – a pouch-like extension of the pectinate muscles. The interatrial septum separates the right atrium from the left atrium and this is marked by a depression in the right atrium –the fossa ovalis. The atria are depolarised by calcium. High in the upper part of the left atrium is a muscular ear-shaped pouch – the left atrial appendage. This appears to "function as a decompression chamber during left ventricular systole and during other periods when left atrial pressure is high". The sinoatrial (SA) node is located in posterior aspect of the right atrium, next to the superior vena cava. This is a group of pacemaker cells which spontaneously depolarize to create an action potential. The cardiac action potential then spreads across both atria causing them to contract, forcing the blood they hold into their corresponding ventricles. The atrioventricular node (AV node) is another node in the cardiac electrical conduction system. This is located between the atria and the ventricles. The left atrium is supplied mainly by the left circumflex coronary artery, and its small branches. The oblique vein of the left atrium is partly responsible for venous drainage; it derives from the embryonic left superior vena cava. During embryogenesis at about two weeks, a primitive atrium begins to be formed. It begins as one chamber which over the following two weeks becomes divided by the septum primum into the left atrium and the right atrium. The interatrial septum has an opening in the right atrium, the foramen ovale which provides access to the left atrium; this connects the two chambers, which is essential for fetal blood circulation. At birth, when the first breath is taken fetal blood flow is reversed to travel through the lungs. The foramen ovale is no longer needed and it closes to leave a depression (the fossa ovalis) in the atrial wall. In some cases, the foramen ovale fails to close. This abnormality is present in approximately 25% of the general population. This is known as a patent foramen ovale, an atrial septal defect. It is mostly unproblematic, although it can be associated with paradoxical embolization and stroke. Within the fetal right atrium, blood from the inferior vena cava and the superior vena cava flow in separate streams to different locations in the heart, and this has been reported to occur through the Coandă effect. In human physiology, the atria facilitate circulation primarily by allowing uninterrupted venous flow to the heart during ventricular systole. By being partially empty and distensible, atria prevent the interruption of venous flow to the heart that would occur during ventricular systole if the veins ended at the inlet valves of the heart. In normal physiologic states, the output of the heart is pulsatile, and the venous inflow to the heart is continuous and non-pulsatile. But without functioning atria, venous flow becomes pulsatile, and the overall circulation rate decreases significantly. Atria have four essential characteristics that cause them to promote continuous venous flow. (1) There are no atrial inlet valves to interrupt blood flow during atrial systole. (2) The atrial systole contractions are incomplete and thus do not contract to the extent that would block flow from the veins through the atria into the ventricles. During atrial systole, blood not only empties from the atria to the ventricles, but blood continues to flow uninterrupted from the veins right through the atria into the ventricles. (3) The atrial contractions must be gentle enough so that the force of contraction does not exert significant back pressure that would impede venous flow. (4) The "let go" of the atria must be timed so that they relax before the start of ventricular contraction, to be able to accept venous flow without interruption. By preventing the inertia of interrupted venous flow that would otherwise occur at each ventricular systole, atria allow approximately 75% more cardiac output than would otherwise occur. The fact that atrial contraction is 15% of the amount of the succeeding ventricular ejection has led to a misplaced emphasis on their role in pumping up the ventricles (the so-called "atrial kick"), whereas the key benefit of atria is in preventing circulatory inertia and allowing uninterrupted venous flow to the heart. Also, of importance in maintaining the blood flow are the presence of atrial volume receptors. These are low-pressure baroreceptors in the atria, which send signals to the hypothalamus when a drop in atrial pressure (which indicates a drop in blood volume) is detected. This triggers a release of vasopressin. In an adult, an atrial septal defect would result in the flow of blood in the reverse direction – from the left atrium to the right – which will reduce cardiac output, potentially causing cardiac failure and in severe or untreated cases cardiac arrest and sudden death. In patients with atrial fibrillation, mitral valve disease, and other conditions, blood clots have a tendency to form in the left atrial appendage. The clots may dislodge (forming emboli), which may lead to ischemic damage to the brain, kidneys, or other organs supplied by the systemic circulation. Left atrial appendage occlusion is an experimental treatment to prevent stroke in atrial fibrillation. The left atrial appendage can serve as an approach for mitral valve surgery. The left atrial appendage can be seen on a standard posteroanterior x-ray, where the lower level of the left hilum becomes concave. Many other animals, including mammals, also have four-chambered hearts, which have a similar function. Some animals (amphibians and reptiles) have a three-chambered heart, in which the blood from each atrium is mixed in the single ventricle before being pumped to the aorta. In these animals, the left atrium still serves the purpose of collecting blood from the pulmonary veins. In some fish, the circulatory system is very simple: a two-chambered heart including one atrium and one ventricle. Among sharks, the heart consists of four chambers arranged serially (and therefore called a serial heart): blood flows into the most posterior chamber, the sinus venosus, and then to the atrium which moves it to the third chamber, the ventricle, before it reaches the conus anteriosus, which itself is connected to the ventral aorta. This is considered a primitive arrangement, and many vertebrates have condensed the atrium with the sinus venosus and the ventricle with the conus anteriosus. With the advent of lungs came a partitioning of the atrium into two parts divided by a septum. Among frogs, the oxygenated and deoxygenated blood are mixed in the ventricle before being pumped out to the body's organs; in turtles, the ventricle is almost entirely divided by a septum, but retains an opening through which some mixing of blood occurs. In birds, mammals, and some other reptiles (alligators in particular) the partitioning of both chambers is complete. ^ "Auricles (of atria) definition". Drugs.com. ^ "Structure of the Heart". ^ Human heart anatomy diagram. Retrieved on 2010-07-02. ^ "American Heart Association - Building healthier lives, free of cardiovascular diseases and stroke". ^ "Jugular Venous Pressure. JVP information; Cannon wave". ^ Applefeld, Mark M. (1 January 1990). "The Jugular Venous Pressure and Pulse Contour". In Walker, H. Kenneth; Hall, W. Dallas; Hurst, J. Willis. Clinical Methods: The History, Physical, and Laboratory Examinations. Butterworths. ISBN 9780409900774. PMID 21250143 – via PubMed. ^ a b Al-Saady NM; et al. (1999). "Left atrial appendage: structure, function, and role in thromboembolism: Review". Heart. 82 (5): 547–54. doi:10.1136/hrt.82.5.547. PMC 1760793. PMID 10525506. ^ Keith L. Moore; Arthur F. Dalley; Anne M.R. Agur (2010). Clinically oriented anatomy (6th ed.). Philadelphia: Wolters Kluwer Health/Lippincott Williams & Wilkins. p. 145. ISBN 9780781775250. ^ a b Homma, S. (2005). "Patent Foramen Ovale and Stroke". Circulation. 112 (7): 1063–72. doi:10.1161/CIRCULATIONAHA.104.524371. ISSN 0009-7322. PMC 3723385. PMID 16103257. ^ Ashrafian H (July 2006). "The Coanda effect and preferential right atrial streaming". Chest. 130 (1): 300. doi:10.1378/chest.130.1.300. PMID 16840419. ^ Anderson, RM. The Gross Physiology of the Cardiovascular System (2nd ed., 2012). See "Chapter 1: Normal Physiology." ^ a b c Anderson R.M. ; Fritz J.M. ; O'Hare J.E. (1967). "The Mechanical Nature of the Heart as a Pump" (PDF). American Heart Journal. 73 (1): 92–105. doi:10.1016/0002-8703(67)90313-4. PMID 6016029. ^ The Determinants of Cardiac Output (video produced by University of Arizona Biomedical Communications; demonstration of atrial effect begings at 13:43). ^ Anderson, RM. The Gross Physiology of the Cardiovascular System (2nd ed.) See "Chapter 1: Normal Physiology." ^ "The Gross Physiology of the Cardiovascular System". Robert M. Anderson – via Google Books. ^ Sherwood, Lauralee (2008). Human physiology: From cells to systems (7th revised ed.). Cengage Learning. p. 567. ISBN 978-0-495-39184-5. ^ Parekh A, Jaladi R, Sharma S, Van Decker WA, Ezekowitz MD (September 2006). "Images in cardiovascular medicine. The case of a disappearing left atrial appendage thrombus: direct visualization of left atrial thrombus migration, captured by echocardiography, in a patient with atrial fibrillation, resulting in a stroke". Circulation. 114 (13): e513–14. doi:10.1161/CIRCULATIONAHA.106.617886. PMID 17000914. ^ Stöllberger C, Schneider B, Finsterer J (December 2003). "Elimination of the left atrial appendage to prevent stroke or embolism? Anatomic, physiologic, and pathophysiologic considerations". Chest. 124 (6): 2356–62. doi:10.1378/chest.124.6.2356. PMID 14665520. ^ Guhathakurta S, Kurian VM, Manmohan G, Cherian KM (2004). "Mitral valve reoperation through the left atrial appendage in a patient with mesocardia". Tex Heart Inst J. 31 (3): 316–18. PMC 521780. PMID 15562857. ^ Corne; et al. (2002). Chest X-Ray Made Easy. Churchill Livingstone. ISBN 0-443-07008-3. ^ a b Doris R. Helms; Carl W. Helms; Robert J. Kosinski (15 December 1997). Biology in the Laboratory: With BioBytes 3.1 CD-ROM. W. H. Freeman. p. 36. ISBN 978-0-7167-3146-7. This page was last edited on 1 April 2019, at 11:18 (UTC).